Wild roses are naturally occurring plants that are scattered all over North America, growing wild in a large swath of the United States. There are several names given to prairie roses, also known as Rosa Blanda, Rosa Pratincula, and of the most popular, Rosa Arkansana. Several states have adopted this flower as their state flower, or have attributed other such honors to it due to its pretty purple flowers with yellow centers. 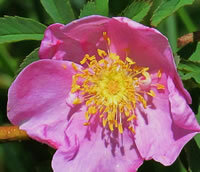 The Native Americans regularly used the wild prairie roses for numerous uses in their daily lives. The hips of the prairie rose are an amazing source for vitamin C and are said to be roughly sixty times what a lemon would contain. The Native Americans would actually store these hips and use them in emergencies when food supplies were scarce. They could be eaten raw or turned into a jelly. They would also pick the younger stems and leaves and boil them into a tea. The leaf galls could be crushed and used as an ointment for burns, and steeping the roots and hips created a useful treatment for eye irritations. These gorgeous little flowers have evolved in the wild and grow in various regions across the United States. They are perennials, meaning they will come back year after year, however do not be alarmed if they die back each winter. You will see them again the following Spring with renewed vigor. Wild prairie roses will grow anywhere from 6 inches to 18 inches tall and their typical blooming period is June and July. The flowers have a rather surprising fragrance for one so small so rest assured, if you decide to add these to your garden, you won't be disappointed. Wherever you decide to grow these wild roses, make sure you give them a space that is worthy of their nature. These plants are extremely invasive and no matter where you put them they will most certainly spread out and try and take over other nearby plants. It is recommended that you give the plants at least 24 to 36 inches of space in between them and be prepared to thin them out every other year and separate the roots. 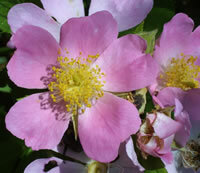 True to it rose nature, wild roses do have a great many thorns along the stems. Anyone who tries propagating these little wonders is going to have their hands full when they discover how difficult they really are. Most growers will try to grow them from seeds, only to find out that most of the seeds of this particular plant often never germinate. This makes it a little more challenging if you were hoping to start your wild roses indoors in seed trays. The best way to add these flowers to your garden is to just buy a live plant from a nursery and let them deal with the headaches of propagation. If you insist of on trying to start your own wild roses from seed, there's nothing wrong with that, just be prepared for a low success rate on germination. When planting, do not bury the seed as you would with other plants. These grow in the wild remember and there's no one there to make sure the seeds are covered. The best way is to sprinkle a few seeds on top of a good potting mix and only lightly press them down. You can give them just a light coating of soil and make sure you water them very well. The soil temperature must be at least 65 degrees if you want any hope of germination. Once you have a live plant established in your garden, you can create all the additional plants you need either by dividing the roots or taking stem cuttings. As I said earlier, this plant is one invasive little plant so you will have no problems having offshoots to dig up and transplant to other locations around your garden. More than likely you are going to find you have so many that you'll be throwing them away or allowing them to take over large areas of vacant land that would otherwise be drab and unused. One of the great things about wild prairie roses is they are extremely hardy and they can hold up to a drought with the best of them. Unlike other, more traditional roses, you won't have to baby these or make sure that the growing conditions are just so. If you want to get a lot of the fragrant blooms out of them, just make sure you give them a nice sunny spot that gets at least 6 to 8 hours each day of direct sunlight and these wild roses will do the rest. The roots of wild prairie roses will go very deep into the soil, some will grow 12 feet in length. This is one of the reasons they are so hardy and can withstand longer periods without moisture. It also means it is something to consider when you are watering them. Don't overdo it. You can give them one good watering each week or you can sit back and let Mother Nature do the job for you. If you find that the location they are in stays damp or soggy for long periods of time, you may have to move the plants as they tend to prefer dryer conditions, as they would find in the wild. 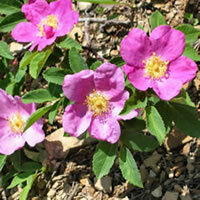 You can mulch your wild prairie roses just like any other plant in your garden, they won't mind. If you live in a location where deer frequently cross your property then you might want to consider protecting your plants with some sort of fencing as deer seem to love eating these wild roses. If you are an animal lover than maybe this is the perfect way for you to invite these woodland creatures into your garden.